I used to have a lot of stuff and maybe I still. Since I started to work I can’t count how many computers I had, how much toys I bought, books, mobile phones, and other stuff. Also I still keeping an average of moving from one house to another each 18 months since I’m 21. On each time, I drop a lot of stuff again. When my son born, was necessary free space to him and I did what was necessary: drop more stuff. Dropped a lot again, almost in the same level when I moved back from Netherlands to Brazil. Meanwhile I’m trying hard to keep a simple life and now it is the first time that probably I have less then 200 things. 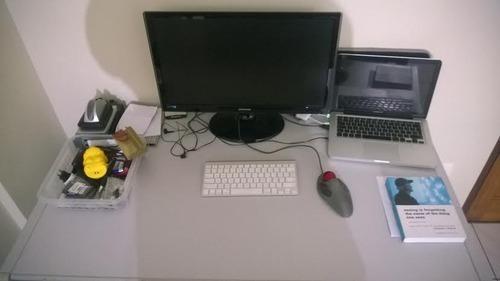 The main picture is my desktop, it has a computer, mouse, keyboard, kindle, external storage, some cables. I used to have several computers, until some days ago they were seven. I didn’t use them, I kept .. because.. I don’t know. Besides I have a TV and a xbox360, bedroom stuff and clothes, a red car and nothing more. Since I have few clothes, now is really like that I have less then 200 things. Also the nice thing is that my wife also thinks more or less in the same way, so we keep the necessary stuff only. This reflects also on our son, he has the baby stuff, some toys, bed stuff, a car safety chair and a baby car. Stuff reduces my freedom. Its hard to move to new place because I have to carry all my stuff with me. That is it. In the end is about freedom. Next PostNext How a password changed my life.